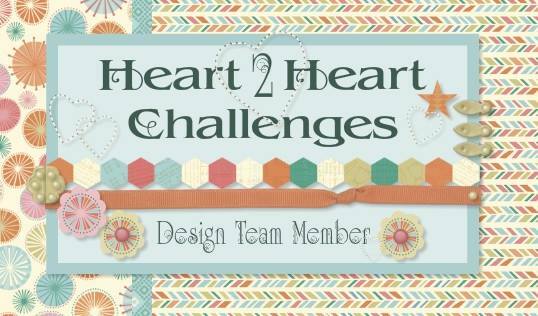 Hello and welcome aboard our August Australasian Close to My Heart Blog Hop. If you have arrived here from Doreen then you are in the right place. Today I would like to share with you a creation which features Close To My Heart’s August Stamp of the Month, For The Love of Crafting. I have some great group photos of my craft group together at our monthly crops, but unfortunately my photo printer has retired early so I have created a layout today to share, but alas no photos on it yet! The photos will be matted on each side of the Happy PML card. I used one of the sentiments to create a border across the bottom of the page using New England Ivy ink, and added some extra detail with one of the die cut flowers and some enamel gems. I love this colour combo of deep jewel colours paired with soft pops of pink. I also used the typewriter and camera stamps as embellishments, and fussy cut out the typed words for some more layering. You'll notice some speckles behind the camera- I added those by using a small section of the heart stamp and using it to add some interest through random stamping. This exclusive stamp set is only available during August. It can be yours for just $7.50 with a qualifying order of $75 or for $30.50 if ordered separately from your CTMH consultant. If you do not have a consultant please contact me or place an order. I'd love you to leave a comment before heading off to the next stop, Passionate About Pages. Using that stamp as a border was a great idea. The little touches of the flower and the gems are perfect. Can't wait to see what photos you use on here! I love the "I love crafting" as a border. Greens and blues are my favourite colours Lauren. Great layout.